Little, Brown Books for Young Readers, 9780316480840, 2896pp. Dive into the complete #1 New York Times bestselling series The Land of Stories with this beautiful paperback gift set. Through the mysterious powers of a cherished book of stories, twins Alex and Conner leave their world behind and find themselves in a foreign land full of wonder and magic where they come face-to-face with the fairy-tale characters they grew up reading about. 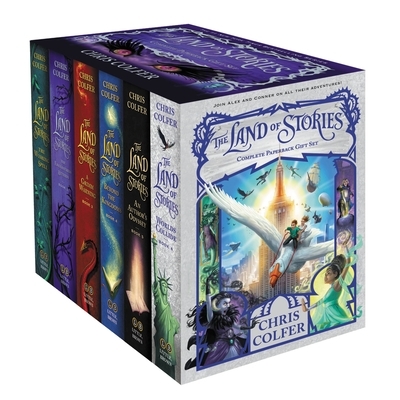 #1 New York Times bestselling author Chris Colfer invites readers to join Alex and Conner from the beginning on their fairy-tale adventures in this gorgeous paperback boxed set, which includes all six books in the Land of Stories series: The Wishing Spell, The Enchantress Returns, A Grimm Warning, Beyond the Kingdoms, An Author's Odyssey, and Worlds Collide. Chris Colfer is a #1 New York Times bestselling author and a Golden Globe-winning actor. He was honored as a member of the TIME 100, Time magazine's annual list of the one hundred most influential people in the world, and his books include Struck By Lightning: The Carson Phillips Journal, Stranger Than Fanfiction, and the books of the Land of Stories series: The Wishing Spell, The Enchantress Returns, A Grimm Warning, Beyond the Kingdoms, An Author's Odyssey, and Worlds Collide and the companion books The Mother Goose Diaries, Queen Red Riding Hood's Guide to Royalty, The Curvy Tree, and Trollbella Throws the Party.